Sometimes people think I'm intelligent, but to me my brain is a fog in the dark. There are thoughts, but I don't know what they are or what they mean. I can feel their shape, run my hands over them, but they are a complete mystery to me. I open my mouth and words come out, but I don't know where they come from...sometimes I say the wrong thing, sometimes I say the right thing, sometimes what I say has no meaning or point. Sometimes I know exactly what knowledge I need, but I can't get my hands around it. It's just out of reach. It's frustrating. Sometimes people tell me I'm beautiful. Who am I to judge? I've never looked like myself. I've always had familiar strangers staring out at me from mirrors. Sometimes I forget that I'm female. The things that isolate me from society have never been due to gender or the way I look...maybe my supposed intelligence, maybe my humour...maybe the fact that I'm not that special at all really. When I think of Gabe, I feel as though I could reach out and grasp his soul. 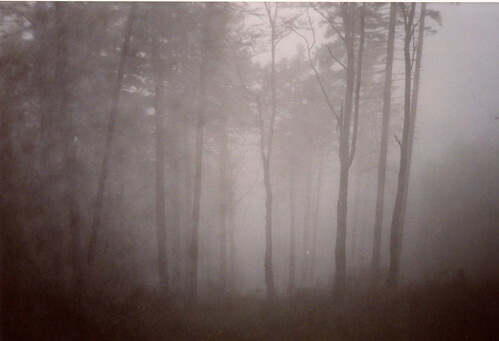 Feel its shape in the dark fog and know it to be him. When I think of other people, I feel the same, perhaps I would not know them...but their soul shapes in the dark would be something I could run my hands over, and perhaps there would be something I hadn't felt before, but it would be them. When I think of myself, there is no shape, no image, no concrete thing. I am the fog itself. Intangible but all encompassing, blind to the shapes I'm hiding in the dark. I'm the only person I know who often forgets that they exist. Once Gabe and I played a game of "how well do you know your friend." There was a question: How often does your friend think people talk about them? Gabe answered on my behalf with "more than I like" but I had choosen "more than I think"...I told him, "I don't mind when people talk about me. I'm just surprised that they do." I don't really exist to myself, so how can I exist to other people? - I'm not here, this isn't happening. Sometimes I can be everything to everyone. I've spent most of my life perfecting the ability. It's not lying. It's all true. I'm just surprised that sometimes when I push things, they fall over.